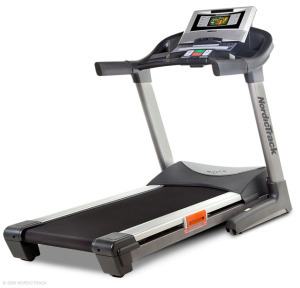 A newer model, the NordicTrack Elite 9500 Pro treadmill offers a 10" web-enabled touchscreen, advanced iFit technology, and commercial-size components in the belt, motor, and rollers. With features like these, the 9500 makes a play for being one of the Best Buys of the season. The large display on the stylish console is easy to read and navigate. The NordicTrack Elite 9500 Pro treadmill comes with a built-in 10" touch screen with a digital tuner that allows you to watch your favorite shows while exercising to one of the 40 pre-programmed Performance workouts designed by personal trainers. UPDATE: AS of 2016, the Elite 9500 Pro is no longer available. It has been replaced by the upgraded Commercial 2450 treadmill. Take a look at our reviews of that one. 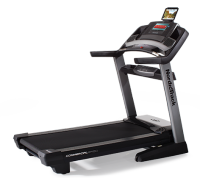 The NordicTrack Elite 9500 Pro treadmill offers a veritable checklist of every feature and component you want in a decent treadmill including a big drive system: a 4.0 CHP commercial grade motor, 2.5 spin balanced, aircraft-spec rollers, and a 20" x 60" tread belt. For entertainment and motivation, it offers a built-in cable-ready TV, premium speakers, a slot for iFit® workout cards, and a plug-in for an iPod® player. For comfort, you get advanced technology cushioning on the deck that is adjustable from soft to firm, from 15% to 33%. On top of all that, it is backed by a 2-year in-home labor warranty, a 5-year parts warranty, and lifetime coverage on the frame and motor. All together, this is one of the best-packaged, mid-priced treadmills on the market today. All of the treadmill reviews we’ve seen on the NordicTrack Elite 9500 Pro have been very favorable with users commenting on its tank-like durability, first class components, excellent cushioning, great workout selection, strong motor, and quiet, smooth performance. For the past three years, treadmill reviewers have not been giving strong recommendations for TV treadmills, but the Elite 9500 Pro gets so many things right that it deserves a closer look. NordicTrack is working hard to convince the industry that a digital tuner can work on a near commercial quality home treadmill. Indeed, this is one of the best TV models we’ve seen. Priced at just $1,699 (with free shipping), the Nordictrack Elite 9500 Pro treadmill is a nice blend of quality construction, fun entertainment, challenging workouts, solid framing, and an above average warranty. For being one of the best models produced by NordicTrack for 2010, the 9500 rates a Best Buy.